AT&T and Deutsche Telekom just announced the sale of T-Mobile USA for $39 billion — $25 billion cash and $14 billion in AT&T stock, giving Deutsche Telekom an 8% stake in the U.S. telecom giant. 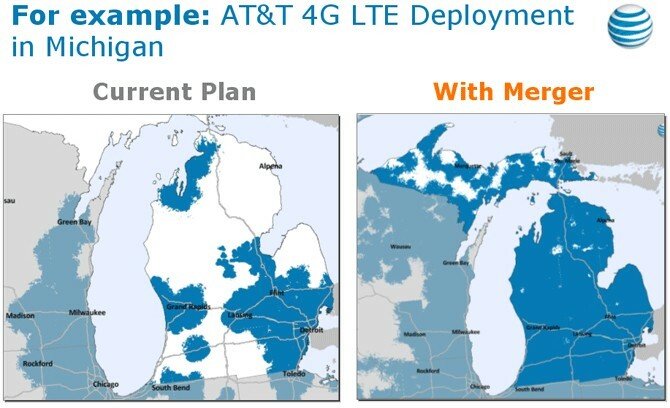 If the deal passes regulatory approval, which the companies estimate will take up to 12 months to complete, the combined subscriber base would exceed 130 million, making AT&T by far the largest mobile operator in America (followed by Verizon and Sprint). 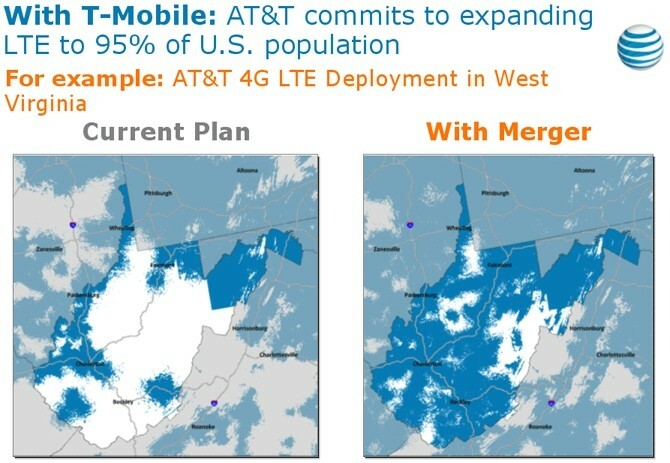 Moreover, since AT&T and T-Mobile are the country’s only major GSM operators, AT&T would gain a monopoly on GSM cell service in the U.S.
AT&T says the deal will bring “straightforward synergies” due to “complementary network technologies, spectrum positions and operations.” The company also claims the deal will expand the footprint of its LTE 4G service by 46.5 million people, to 294 million, or 95% of the U.S. population. 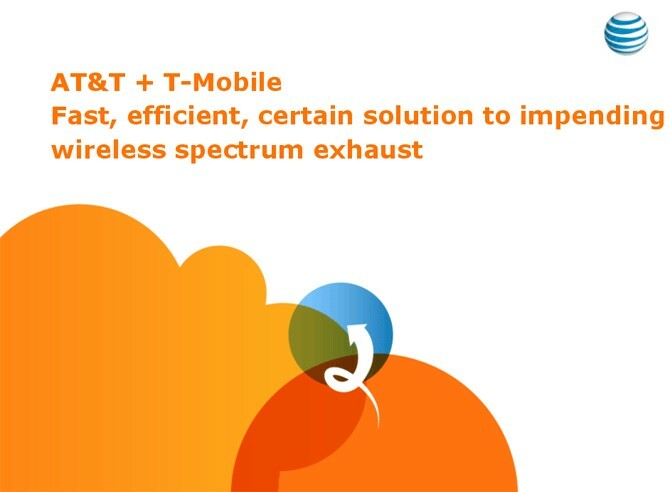 T-Mobile USA itself had no clear plans to migrate to LTE, however, suggesting that AT&T intends to use T-Mobile’s AWS spectrum (1700/2100 MHz) for LTE, alongside its own 700 MHz bands. If the deal does not receive regulatory approval, AT&T will have to pay T-Mobile a $3 billion “breakup fee,” transfer AWS spectrum it is currently not using for LTE deployment to T-Mobile, and sign a roaming agreement to give T-Mobile access to its network. Read on for more about the deal. AT&T seems to be inching closer to regaining the strength it once had as a telecom monopoly before the U.S. goverment broke it up in the early 1980s. Deutsche Telekom had been seriously considering exit options for T-Mobile USA for many months prior to today’s announcement. Several reports cited Sprint as a merger, sale, or acquisition (+ spin-off) target, but the two companies’ entirely different technologies (CDMA + WiMAX vs. GSM + HSDPA+) make such a linkup unlikely. 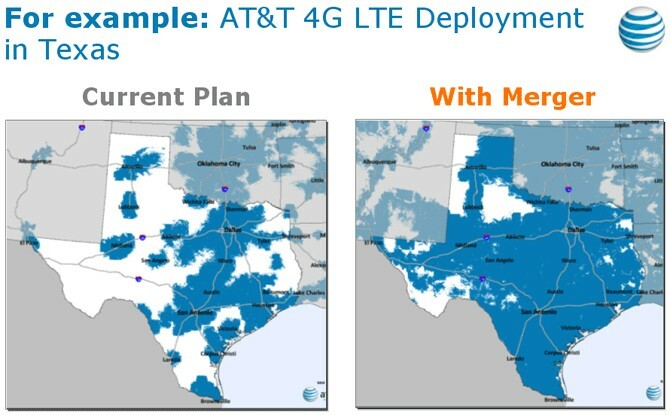 The AT&T takeover makes much more sense technologically, and the prospects of a nationwide LTE deployment are indeed exciting. However, the implications of a GSM monopoly are unclear as of yet. T-Mobile has traditionally been much more liberal than AT&T in allowing its customers to use cell data tethering, unlocked phones, contract-free plans, and the like, and it does significantly better than AT&T in customer service satisfaction surveys, so its customers might stand to lose from an AT&T takeover. The deal faces an enormous risk of government antitrust objections– a Credit Suisse analyst commented that he had “never seen a deal with more regulatory risk be attempted in the U.S.” AT&T is keenly aware of this, however, and has carefully crafted its press release to assuage regulators’ concerns. Instead of mentioning the size advantage it would enjoy over Verizon after the deal, AT&T highlights the benefits it would bring to American consumers through $8 billion in infrastructure spending. 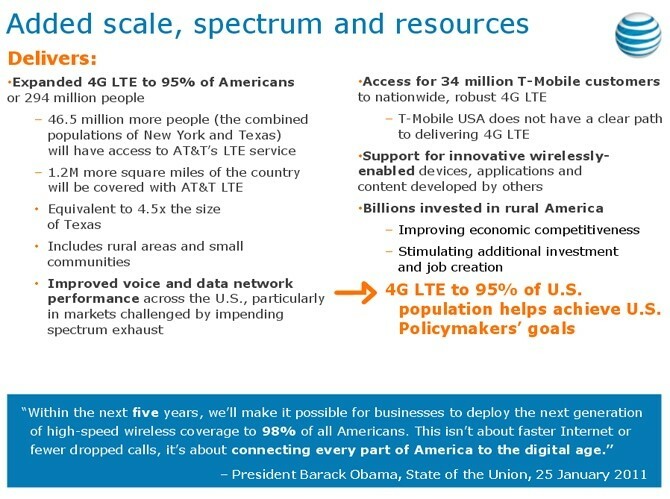 The release also ties AT&T’s LTE 4G plans to President Obama and the FCC’s vision to deliver high-speed mobile internet to rural communites across America. In the press release, AT&T’s Chairman and CEO Randall Stephenson says the deal is “a major commitment to strengthen and expand critical infrastructure for our nation’s future” and will “help achieve the President’s goals for a high-speed, wirelessly connected America.” The company also calls attention to its union workforce and how the deal will boost the competitiveness of the U.S. wireless industry and improve cell connectivity across the country. Deutsche Telekom will take an approximately 8 percent stake in US telecommunication company AT&T. At the same time Deutsche Telekom will hand over 100 percent ownership of T-Mobile USA to AT&T. This has been agreed by the boards of the two companies today. AT&T will pay 25 billion USD in cash for T- Mobile USA, in addition to 14 billion USD in AT&T shares. AT&T has the right to increase the portion of the purchase price paid in cash by up to 4.2 billion USD with a corresponding reduction in the stock component. The value of the transaction will be 39 billion USD. This will amount to an attractive multiple of approximately 7 times 2010 adjusted EBITDA. The merger still needs US regulatory approval. The closing of the transaction is expected to be completed in first half of 2012. Deutsche Telekom is planning to reduce its debt by approximately 13 billion EUR. Approximately 5 billion EUR are planned to be used for share buybacks after closing and required resolutions in accordance with the legal requirements . For Deutsche Telekom the transaction after closure will provide amongst others a consolidation of the balance sheet. Pro forma the ratio for net debt to adjusted EBITDA in 2010 will be reduced to 1.9x from 2.2x, a reduction of 31 percent. There will be no change regarding the shareholder remuneration policy which has been set for three years. As has been provided within the legal guidelines, Deutsche Telekom will continue with its plans to pay out 3.4 billion EUR on an annual basis consisting of a minimum dividend of 70 cents plus share-buybacks. The share buybacks amounting to approximately 5 billion EUR, which are planned after the closure of the transaction, will come on top of this. The Guidance for 2011 remains unchanged. For the financial year 2011 Deutsche Telekom expects an adjusted EBITDA of around 19.1 billion EUR. The free cash flow is expected to be stable to slightly growing from the 2010 level of 6.5 billion EUR. Deutsche Telekom is to receive one seat on AT&T’s Board of Directors. Morgan Stanley acted as lead financial advisor and issued a fairness opinion to the supervisory board of Deutsche Telekom. Deutsche Bank and Credit Suisse acted as financial advisors for Deutsche Telekom. Deutsche Telekom was advised by Wachtell, Lipton, Rosen & Katz (M & A, N.Y.C) as well as Cleary Gottlieb and Wiley Rein (antitrust and regulatory law, Washington D.C.).